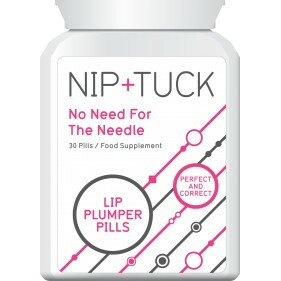 Nip & Tuck, Perfect Pout - No need for the Needle, Lip Plumper Pills, have been uniquely designed to give you bigger, fuller lips! You will have the effects of lip fillers - without the need for the needle! The results are truly amazing! The lip plumper pills have been clinically proven to enlarge the size and fullness of your lips, for a bigger plumper, more kissable pout! The pills have been formulated using 100% safe and natural ingredients; that will also nourish your lips and ensure your lips are soft and smooth. The active ingredients begin to work instantly – totally transforming thin lips into the plump and perfect pout! • Have the effects of lip fillers - without the need for the needle! • Clinically proven to enlarge the size and fullness of your lips! • Uniquely designed to give you bigger, fuller lips! • Totally transform thin lips into the plump and perfect pout! • Treatments developed alongside an expert team of cosmetic surgeons!